Getting the most from your paints takes some experimenting and practicing. As a painter progresses, they usually find themselves looking for ways to improve their painting and ultimately they come across someone saying, "Thin your paints, it's what you need to do." You can search any of the big forums or lots of other blogs and most people say you want to get your paint the consistency of "milk." That's all good and well, but it doesn't always help. It's a great way to give you an idea of the general consistency you want to your paint, but it's not the whole picture either. Let's look at thinning first and then some other things you can do to help. So how much do you thin your paints? For me, the amount of thinning depends on the brand and color of the paint. That means some colors don't need to be thinned and some do for my style of painting. The trick for me is to add only as much water as I need so that I do not create any surface texture (visible, textured brush strokes) when I apply my paint. This is created by paint that is too thick and your brush strokes end up showing on the model. Nothing kills a paint job quicker than this. When I add water, the ratio varies all the time. I have no set amount I use. Most of the time though, I'll start with a tiny bit to see how the paint reacts and go from there adding more if I feel I need it. I don't use any fancy retarders or extenders when I paint. Maybe it shows, but most of the time, I need to move quick, so I'm shooting for tabletop results. NOTE: Word on the street is that the new GW paints don't really need thinning. I haven't had a chance to use them myself, but I'd be interested in hearing what folks have to say on that. This is a big one I find with folks starting out. You'd be surprised at how little paint you need to cover an area, especially if you add a tiny bit of water to it. If you're using too much paint to begin with, adding water isn't going to help. Here's what surface texture looks like when you apply paint too heavy. You can end up with obvious brush strokes and unwanted surface texture. You can minimize this to a great extent by applying only as much paint as you need to in order to cover an area. Too much paint leaves excess on the model. This can be done before you even think about thinning with water or any other extenders. Another way to avoid surface texture is to always keep a wet edge to your paint. That means not letting the edge dry out as you paint across and object. Larger objects make this tougher to do, but smaller things should not pose a problem. If you let the edge dry, it has the tendency to leave a tiny amount of texture in the form of a lip where the first layer of paint dried and where you go back over it with another pass to finish off the area. Think of the "tide marks" a wash will leave when it dries... it's like that but with a raised edge. You don't want that. The reason your primer color matters is because it helps fill in the minor places you have color imperfections. Light colors over light primers and dark colors over dark primers. If you know that adding a bit of water to your color will make it ever so slightly transparent, then it helps to have a similar color underneath to support it. 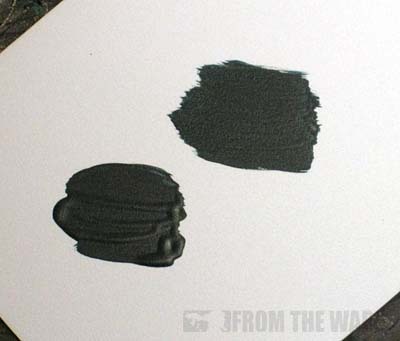 If you look at how the different colors act over black and white, you can see some will need less layers of paint to get a nice, smooth finish depending on what's under them. The light tan color will end up better over white than black. The purple color will do better over the black. If we know we are going to thin to help reduce any surface texture and thinning makes our paints slightly transparent (even more than they may already be when they started), why not make it as easy on yourself as you can? Using good priming practices (light for light, dark for dark), we are better off trying to get a good, smooth finish to our areas by using a few passes of slightly thinned color than one heavy pass. This approach allows us to keep more detail on the model and we run less of a risk obscuring it with thick paint. What about too much water? If you use too much water, you're basically turning your paint into a wash and it will act accordingly. Pooling in the recessed areas, allowing the color underneath to show through, tide marks and so on. This can be good or bad depending on the look you want. 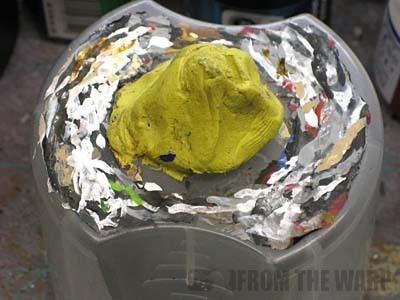 Most of the time, this is bad because the person wants the thinned paint to minimize the chance of surface texture or the buildup of paint, but finds themselves adding a hundred layers in order to cover up what's underneath to get a smooth, consistent finish to that area of their model... which results in built up surface texture and a large build up of paint in the end. Be extra careful when washing over light colors such as whites and yellows or any light color for that matter. Since they are so light, the wash picks up (makes visible) all of the surface imperfections. This can quickly make your model look horrible as you can see every little unwanted surface texture on the model. 1. 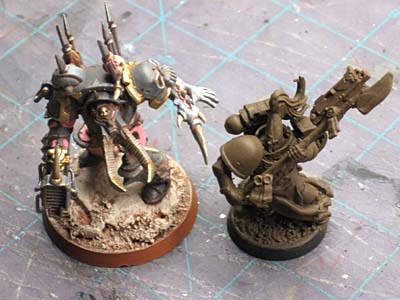 Clean your models beforehand to remove any chemicals, films, grime you can't see. Nothing fancy, just a quick wash with warm soap and water after being assembled. 2. Don't handle your models when painting them. Mount them onto something to avoid getting skin oils on the model which will not react well with paints and prevent you from getting that smooth coverage. Think trying to paint Forge World models without washing them first. 3. Shake/mix your paints each time before you use them. 4. Prime with an appropriate color to help "hide" inconsistencies. 5. Add to the previous one the idea of using similar color base colors. For example, Ork skin, a dark green base color will help you with applying you brighter greens and getting a nice finish. GW Foundation colors are perfect for this kind of thing. 6. Make sure you don't overload the brush for the size area you're painting. If I know I'll need more paint than what I can put on the brush in one pass, I'll transfer my paint over to a small palette and work from there. That way I can mix my paint and water, clean my brush off quickly and then put the right amount of paint back onto the brush before I touch the model. 7. Thin with just enough water. I get some paint on my brush and then dip that into my water pot. Since I have my brush only covered about 1/3 of the way up the bristles with paint at any one time, I dip only the tip into the water. Some paint comes off and some water is picked up by the brush at the same time. I roll my brush on my holding base (the thing you mount your model to so you're not holding it with your fingers while trying to paint) to mix and remove excess and then go from there. This can also help reshape the tip of your brush into a fine point. This is what the caps (I use regular spray paint caps) I stand my minis on look like after a few paintings. You can see all the little markings along the edge where I have removed excess paint from my brush before painting. Different folks use different things to do this. All in all, thinning your paints will help with getting a smooth application on your models. But there are other things you need to be doing as well to help that process along. great article Ron but as a little comment about the new gw paints, I tried them out at the forge world open day and I have to admit that they're awesome. especially the ceramite white which covers smoothly in just one coat. OVER BLACK UNDERCOAT. I can't wait to get my hands on a pot as my marines are trimmed in white and this is gonna be a true time saver. Its weird, i also tried the new GW paints at the open day, and thought the new bases were not as good at covering as foundations, i also fell into the trap of thinning the new layer paints, they didnt cover for toffee, its a habit i couldnt shake, the idea of just out of the pot seems a bit iffy. All the new paints had a weird kind of "slipperyness" to them i felt. it was REALLY hard to describe, but im defiantely going 90% vallejo now. hurry up and try them ron! one advice, you can always use spunge from any blister pack, put it in plastic box of similar size (like those boxes for GW metal miniatures like Sternguard, Sisters of battle and so on...), put little water so your spunge is moist and add paint on surface. that way, your paint is always wet. and you can dose water just by pressing your brush on spunge. I have mucked around with a wet palette in the past to manage the consistency of paint as well, but given my glacial painting rate (I kid you not), the sponge had begun to rot in the water! great in depth article. thanks for the insights, i end up being to impatient to do these steps properly! Ginger Kid: I haven't had a chance to get into the new paints, but maybe this weekend. I've heard/seen mixed reviews especially with the metallics. Marsekay: I'm planning on buying them this weekend once I get some time to run over to my FLGS. I saw they have all the new stuff in stock. It might take me a week to get something posted, but you can expect a full report. Perun: Your English is fine and thanks for the tip! Adam: Now see I'm the opposite. I would have all kinds of paint on my sponge and no more free room since I would have moved onto new projects so quick. Alex: Mine too! Sometimes it will all peel off in one giant piece too once enough paint builds up on the cap. vadalworks: I'd be interested in seeing what you come up with once you get a few more paints to work with. I have found that Vallejo paints don't need any thinning. It flows very, VERY well. That being said, I do think that it is something I would have loved to know earlier in my painting career, thinning GW paints (ESPECIALLY thicker ones like Bleached Bone) make painting with it so much easier and better. It also gives you a lot more control and makes the paint easier to spread and move around. Also I use an old GW paint pot filled with pennies and BlueTac on top to secure my minis. Fayte: Perhaps the new line and the lack of a need to thin is GW's way of making their paints a bit more accessible to beginning painters. If all you have to tell someone starting out is "Just paint it on there" it makes it much easier than having to explain how to thin paints so they can paint their brand new models. I suspect other companies have known this for a while now and adjusted their mixes accordingly. Oh I agree completely. The idea that the GW line is trying to give beginner painters the ability to put together very good looking paint jobs is exactly what needs to be done. Vets can get complex and do what they like, but starting out it will give a model a great paint job with out needing to know every technique. I think GW is going in the right direction. I'm only upset over the name changes. Now I have to remember a whole set of new names! I've never been able to convince myself its worth the effort to use a mounting platform for models. I typically paint 5-10 models when infantry at a time though so that is part of the reason. I just hold it by the base and it works for me. Because of this though I constantly use my thumb as a pallete like you've used your spray lid. Looks like I went a little nuts with nailpolish after a night of painting. Fayte: Keeping the same names and adding new ones where needed would have helped with consistency I think as well. TheAmbit: If it works for you, then by all means, go with it. I think the real trick is to look around at what others do, try a few methods out for yourself and the settle in with the one that suits you best. If it's holding them by hand, there's nothing wrong with that. It's a trade off... you don't have to worry about pulling them off the Blu-tac and I don't have to try and hold onto 25mm bases all day. really interesting to read some more early thoughts in the comments on the new GW paints - i find the lack of consistency on their consistency across range really problematic and was about to move wholesale to another brand when the new ones were announced. i definitely lean towards multiple, thinned layers as a technique, usually because i like the "faded" look you can achieve with it on Marine gear. oh, and i roll my brush on the edge of my tatty painting desk, which drives the wife nuts! I really love the way you paint! This is a great article and i'm going to steal everything you said to try and improve my painting. Thanks for posting it. BoH Thanks! If you're talking about the Space Wolf marine at the top of the post though, it is not mine, perhaps I failed to make that clear. 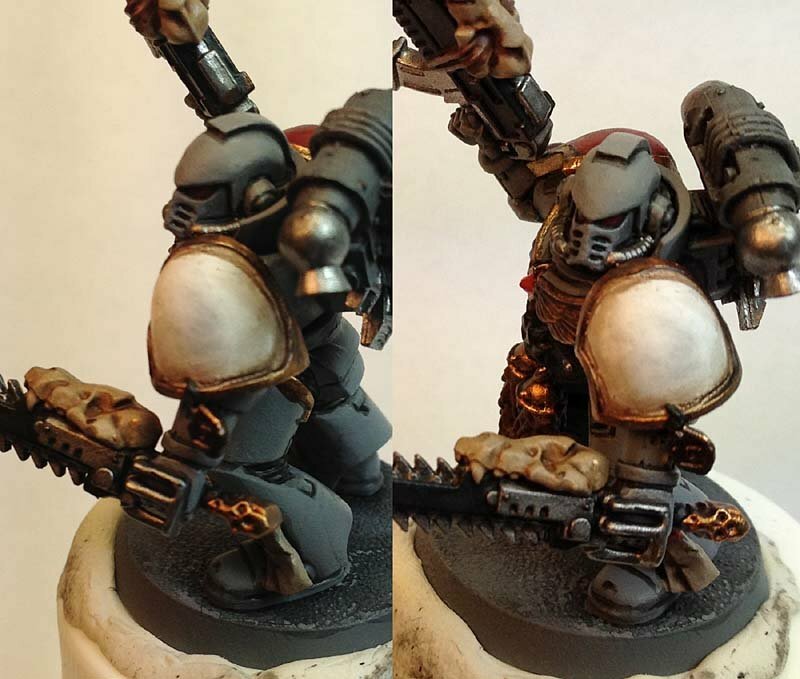 It came from a reader who was looking for a few tips to get smooth, white shoulderpads for his marines. Malduran: Take whatever you need and make it work. Yeah ive tried the new paints and i agree with some of the comments above. the base paints cover better than that old foundation paints, but i dont use them much anyway. the layer paints are "weird" i find them to have a slight "scratchy" feel... they dry fast too. similar to a lot of Valejo paint. the texture paints are a brilliant idea though and make basing very easy. and the dry brush paints are good for what they are aimed at. My earliest Ultramarines had serious problems with brush strokes and texturing. While experimenting, I found that I could reduce this effect by dipping the brush in paint first and then quickly dipping it into my water pot. It means that I have to use more layers to cover a black primer, but I'm a lot happier with the results. I had to laugh when I saw Ron recommend that exact same technique. Thanks a lot, I'm realy going to use some of those ideias on my painting. Ron I reread my post and I didn't mean to judge by anymeans! Hope it didn't come off that way. TheAmbit: Not at all, no worries. Didn't think that at all. I'd much rather folks speak their mind and get involved. I actually find it hard to use my fingernail to wipe off excess paint. I've tried it before, but it seems odd to me. I always used to have terrible trouble getting my paint consistency right and even more trouble keeping it right. As it dries on the palette you end up having to tease more and more water into it and occasionally I would find that I'd get it wrong and have a massive watery blob flow off my brush over painted surfaces. Very annoying! Recently I started using a wet palette and I just can't believe how easy it makes everything. I find I can put some very thick paint down, like a GW foundation paint, and after a few seconds it has magically adopted the correct consistency for painting. And it stays right for hours. 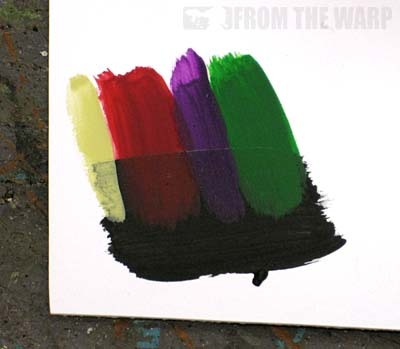 I can break for lunch, come back and resume where I left off with the same palette full of paint I was using before. If you haven't tried it I would thoroughly recommend it. FluffyPanda: To be honest, I've never felt I needed a wet palette. I use such small amounts of paint and it's just a habit of mine to mix paint and water and keep the consistency close to what it should be. I can say that I don't think I've ever heard anyone say something bad about them though. I thought the same as you, until I tried it. I seem to paint so much quicker now that I'm not messing about keeping the consistency right too. I suspect you're rather better at that part than I was, so it might not be as revelatory for you. FluffyPanda: Time to go steal some tupperwear from the Wife then and see what I can come up with. Parchment paper though... might have to go buy that. Might be some in the kitchen. Here in the UK we usually call it baking paper. As long as it's not waxed it should work just fine I believe. Thanks for this post. I've just started 40k and I'm really struggling to get a good look for my Orks. I'll take on board your tips next time I pick up the brushes! Kryptonick: Excellent, glad it helped! Hey Ron, Duane here. I'm the guy that asked for help with the white shoulder pads. It was cool to see my test model on your blog! Thanks for writing up this article and replying to my earlier email. It should be a huge help. I think my Vallejo white that I'm trying to use has partially dried in the pot and that's what gave me issues. I was able to pick up one of the new GW "Base" paints in white this past weekend but haven't been able to try it yet. I should be able to give it a try this week. Normally the Vallejo whites don't need much thinning at all and I think mine being partially dried is giving me problems. Duane: I bought some of the new GW paints this weekend and am trying them out myself. I was tempted to go with Vallejo but they are not too easy to come by in my neck of the woods. I'd be interested in seeing how the new paints work out for you. Vallejo aren't too easy for me either which is why I went for the GW paint. There is a GW store 10 minutes off of the train I take home so it's a quick stop for me to gab a paint and get home, despite paying a premium for them they are the easiest paint for me to get. I've had great luck with Vallejo and have never had one dry out on me before. I think I let some paint cake up in the lid and ruin the bottle I had. I just noticed that I left a big old mold line on that test models back pack. I need to fix that STAT! It's funny how I see things in photo's that I miss first hand. As regards the article, great stuff! It shows how this issue is perhaps the most subjective of all techniques. remedy many of the problems I had, but of course created a new challenge in not over-thinning my paints. For the most part it has helped my metallics the most, as it doesn't disperse the micah fragments of the paont nearly as much as using water. Brainwashed: I'm working with the new GW paints now and will be posting some of the things I've discovered while doing another Novamarine test model in the coming week. Dain Q. Gore: See now I've never been a big fan of the flow improvers due to the thinning it causes. Maybe for glaze type applications, but not staright painting (layering and such). Cornu Mortem: Excellent stuff, thanks for the link! I got to use the GW new Base White last night and I am pretty impressed. I was able to go over black readily.